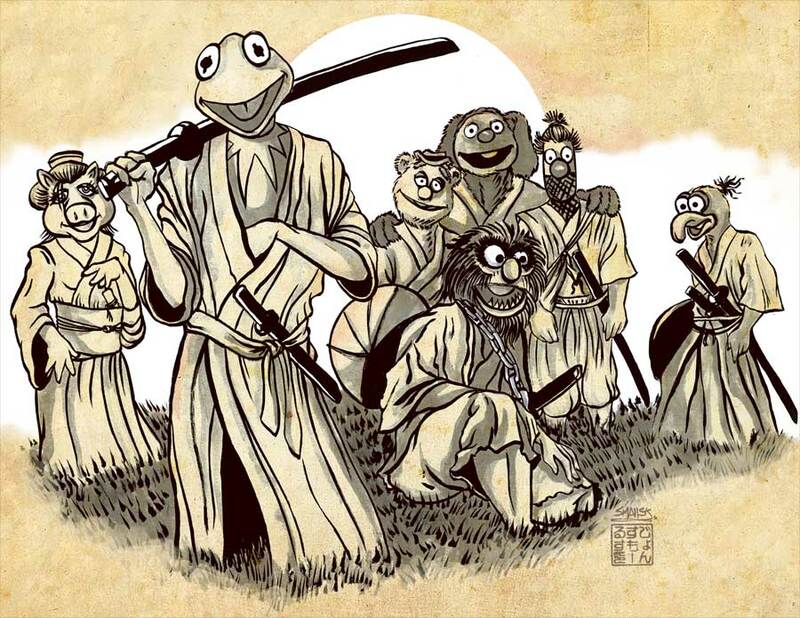 Lucky Gi was founded by Scotty Nelson who also brought us On The Mat (OTM) way back in the Stone Age of BJJ. Scotty’s obsession with gis began in the 90’s while training in Brazil and has been growing ever since. After years of traveling, training and researching he decided to make his own gis and to break with tradition by using factories in China, instead of Pakistan, and to experiment with other fabrics, notably bamboo. Lucky’s gis have included the bamboo Fleur-De-Lis and signature fighter gis such as the Raphael Lovato Jr, Jeff Glover and currently the Diaz Brothers gi (also in black). For this review we’ll be looking at the Diaz Bros gi. The gi has a 550gm pearl weave top, 12oz bull denim pants, sizing options for everyone (tall & husky sizes are available and you can mix & match the jacket to pants) and comes with a travel bag. The jacket is constructed of 550gm pearl weave and has a feel very similar to my DOorDIE Hyperfly. It is a single piece of fabric that has internal printing of a stylized “LG” and the symbols of the different suits from a deck of cards. The seams are reinforced with extra stitching at stress points. The seams are also folded over before being stitched for a comfortable and aesthetically pleasing look. There is extra reinforcement at the side slit but not at the armpits. The cuffs and bottom of the skirt have cotton cloth tape on them for comfort and strength. The stitching throughout the jacket is consistently uniform and of high-quality. The pants are constructed of 12oz bull denim. If you’re like me you have no idea what that actually means. To save you the time I looked it up and it’s essentially the same denim that is used jeans but can be lighter (this one is), softens over time (yep) and is a 3×1 twill weave. The waist of the pants is off-set similar to the Hyperfly and Bull Terrier Super Gold. The pants ship with both a drawstring and cord. There are 4 belt loops and knee reinforcement. The knee reinforcement is a little on the small side (8.5” x 11.75”). The cuffs are lined in red cloth tape, the seams are reinforced at stress points, and the gusset is also made of bull denim. The collar is foam-filled and pretty typical of most gis. There is red contrast stitching on the collar and a small Lucky Gi logo at the base of the collar. The only other bling on the front of the gi is small (1.75” x 3.5”) “LuckyGi” patch on the left breast. The right sleeve has the gis signature logo embroidered just below the shoulder while the left sleeve has Lucky’s logo just below the shoulder and a red Ace of Spades near the inside of the wrist. The back of the gi has substantially sized (10.5” x 4.5”) embroidery which is “Lucky GI” with a black belt under it. 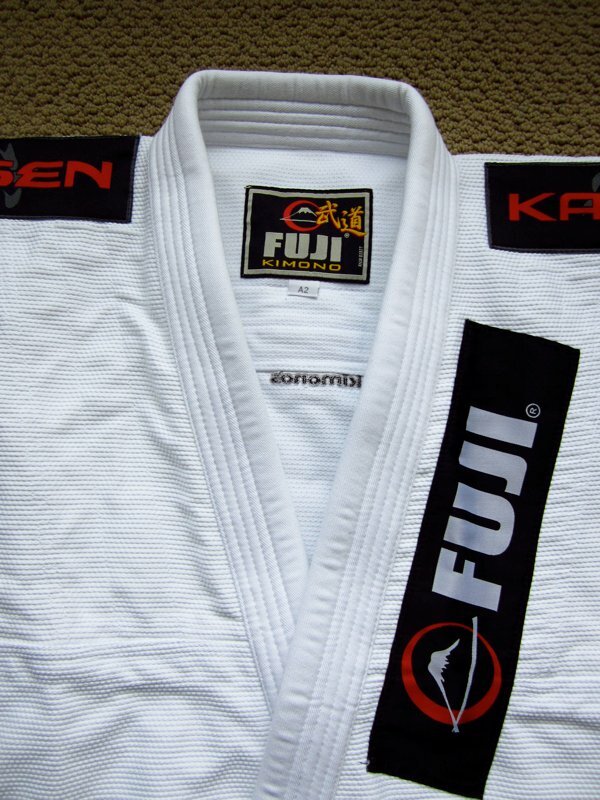 The embroidery and patch are well sewn which is consistent with the sewing throughout the gi. The only concern with the aesthetics of the product is the questionable placement of the Ace patch on the left wrist with regards to IBJJF rules. The pants are very simple and straightforward. There is a single very small patch on the upper left thigh and Lucky’s card suits embroidery is the outside of the right leg near the calf. The cuffs are lined with red cotton tape. The single biggest draw with this gi is the flexibility that you have with sizing options. There are 8 different options for the top and 9 for the pants. You are also able to mix and match the jacket and pants for a total of almost 60 different size combinations which cover the full spectrum of skinny to husky and short to tall. After reading their sizing chart I got the A2L top and A3L pants (6’4″ & 190lb). Right out of the package the pants fit very well. The post shrinkage measurements represent a few dozen times washing and hang drying. The top fit well in the chest and arms but was a little long so I dried it thoroughly once to intentionally shrink it and now it fits even better. The shrinkage after that was minimal. One thing that I did notice is that when it’s wet (from laundry or sweat) you can see through it a little and the red symbols on the interior become somewhat visible. The Diaz Bros has been in heavy rotation since I got it a few months ago. If it’s clean and I’m not reviewing another gi this is the one that I usually wear. The fit is very good, it’s comfortable to roll in and it isn’t overly hot even when I’m wearing a rashguard or compression gear underneath it. I haven’t noticed the pants hitching while I’m playing open guard and the gi has held up very well over the last 2 months of heavy use. The knee patches are pretty small but after reading up on bull denim I’m not sure that wear in the knees is going to be an issue. Two things really stand out about this gi and I’m sure all of you know the first one. At $249.99 this is an expensive gi and not something that everyone can afford. It is constructed in China, a limited edition run, has high-quality construction and has some unique features such as a 1 year warranty. The other thing that sets this apart is the plethora of sizing options. I’ve rarely seen so many sizing options in a gi and the sizing chart is one of the best that I’ve seen. The fact that Lucky lets you mix and match sizes so that you can get exactly the size that you need is also a huge bonus. 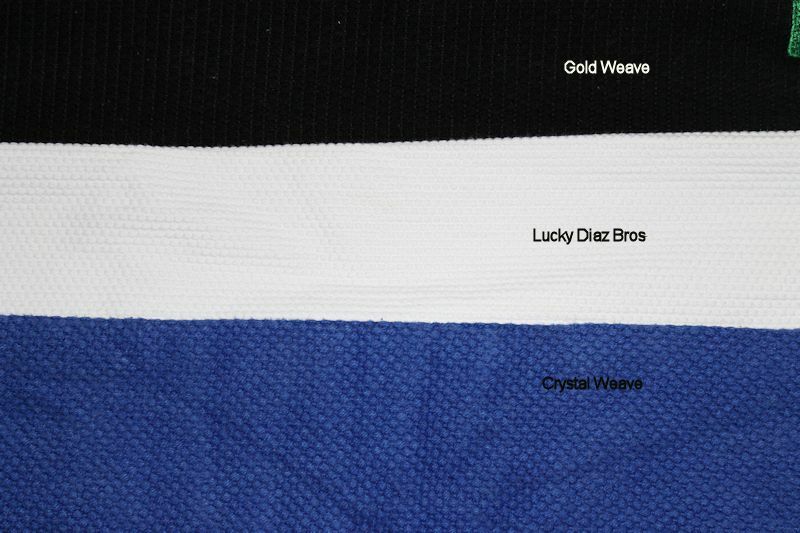 The Diaz Bros gi by Lucky Gi is an expensive gi and not for everyone. However, if you can afford it you’ll be getting a gi that fits you perfectly, has a 1 year warranty, is constructed with quality materials, and will stand up to heavy use. For more information on Lucky Gi check them out at their website, Facebook and Twitter.